The letter Z inspired twenty-four zesty Indian flavors! First, we take a tour of the Zany Zucchini Cafe. Our menu is diverse, the choices are many, but they have one thing in common- you guessed it, Zucchini, that mild and juicy summer squash! Let's start with the breakfast menu. We have a choice of three savory dishes today. First up, Asha of Aroma/ Foodie's Hope serves up her Zucchini Carrot Adai, which is brimming with nutrition in the form of brown rice, dals and vegetables. The second is another savory pancake prepared by Jyothi of Andhra Spicy. Her Zucchini Besan Puda is made with a instant batter of chickpea flour and shredded zucchini, with a touch of cumin seeds. The third breakfast choice is a soft, spongy savory cake. Zucchini Tower is the lofty creation of Live2Cook of Live To Cook and is rich in dals and succulent zucchini, steamed in special molds. All three breakfast choices come with a bowl of creamy Zucchini Chutney shared by Lakshmi of Veggie Cuisine. The combination of hot-off-the-griddle dosas and steaming hot idlis with the cool chutney promises to be delicious. Our lunch and dinner menu is very extensive, as you will see. For a classic Indian appetizer, we offer a crisp and golden Mixed Platter of Zucchini Bhajjis, courtesy Priyanka of Lajawaab. As for the main course, we have something for everyone. If you are in the mood for something simple and home-style, Suma of Veggie Platter has a comforting Zucchini Tomato Pappu or dal that will warm you from the inside out. Do we have any veggie lovers in the house today? I have a feeling we do! For you, Archana of Tried and Tested Recipes presents her signature Zucchini Zaaykedar Sabzi- a medley of juicy vegetables sprinkled with the choicest seasonings and baked to perfection. For those diners who are calorie-conscious, we have just the thing for you too: Zlamushka of Zlamushka's Spicy Kitchen dishes up her Zucchini Koftas- tiny bites of shredded cooked zucchini, rolled in crunchy sesame seeds and baked, not fried, then served with rice and a velvety curry. We know that some people love their dairy, and for them, the perfect choice would be Zucchini Paneer Sabzi- a combination of crunchy zucchini half-moons and creamy paneer cubes, stir-fried perfectly by Musical of Musical's Kitchen. Finally, for those seeking good old-fashioned restaurant style richness, we present Raaga of The Singing Chef and her Zucchini Capsicum Makhanwala- here, zucchini dances a tango with a medley of colorful peppers in a rich and creamy sauce that is delicately flavored. Ok, now that we had our fill of zucchini, we have a lot more delicious food on display today. The next Z vegetable is colored the daintiest shade of purple- the purple yam or Zimikand. Suma of Veggie Platter cooks into a sweet and creamy dessert that is the color of pale lilac- go take a look at her Zimikand Halwa. In a burst of vegetable love, G V Barve of Add Flavour uses five Z zutaten ("ingredients" in German) to make a vibrant and colorful dish of Mixed vegetables. Then comes a Z fruit, the appetizing Zardaloo or dried apricot. Bee and Jai of Jugalbandi write a wonderfully informative post, then go on to share a vegetarian version of a traditional Zoroasterian dish- their creative stew is called Zardaloo zSali zSoy! First, a spice that has reached the zenith of expensive taste: Zafaran or saffron, the most prized spice in the world, more expensive than gold (weight for weight)! In Indian cooking, saffron is most likely to find its way into festive rice dishes and desserts. Anita of A Mad Tea Party writes a beautiful ode to the precious Kashmiri saffron and shares a recipe for the most exquisite dessert- Zafraani Zamadud or yogurt made with saffron-tinged milk. Dhana of Fresh Kitchen uses saffron to bring a delicate fragrance and flavor to her very unusual Zafarani Pulao, made with a harvest grain blend instead of rice. Manasi of A Cook At Heart takes a cue from the latest Bollywood blockbuster and make a Zafrani Pulav- Amitabh-style, rich with raisins and nuts, and redolent with whole spices. The next spice is actually a spice blend, and it has a definite zing to it: Zaatar is a flavorful thyme-based spice mix that is popular in the Middle East. Nandita of Saffron Trail sprinkles zaatar between sheets of tender dough and turns out some flaky and golden Zaatar Flavored Parathas. Saju of Chachi's Kitchen shares a wonderful recipe for making zatar, then uses it creatively in a Zaatari Salsa that she uses, along with roasted zucchini, in a creative chapati wrap. Now it is the turn of a Z dish that is as non-ritzy and non-jazzy as it can get: the simple and rustic Zunka of rural Maharashtra. Sauteed vegetables are cooked with chickpea to make a simple and tasty dish. Suganya of Tasty Palettes uses a trio of colorful peppers to put together her Zunka with Capsicum- go take a look at her gorgeous pictures jumping off the screen. Madhuli of My Foodcourt uses tender and fragrant fresh fenugreek leaves to make this beautiful dish of Zunka with Fenugreek- and she has some interesting information about an alternative name of this dish too. The next Z word stands for zip and zilch...it is a big fat zero, as in Zero-Oil! Dhana of Fresh Kitchen tries a dish from a new no-oil cookbook, and her Zero-Oil Kebabs look 100% flavorful. We end this last round-up with two words that represent that pizzazz which is the signature of Indian cuisine: the word zhanzhanit in Marathi, and the word zhaal in Bengali both mean uber-hot or ultra-spicy. Aarti of Aarti's Corner pounds together roasted chillies, garlic and peanuts to make this unbelievable Zhanzhanit Thecha. G V Barve of Add Flavour makes her Zhanzhanit Thecha with some fiery red chilli powder. Finally, for a tasty tea-time snack, Aarti of Aarti's Corner tosses together puffed rice with lots of goodies and a generous dose of chillies to make a popular Bengali street food- Zhaal Muri. Z is for Zucchini Kofta Curry: Ze End! In January of this year, I found myself in a new city, recovering from a very stressful year, facing the end of a blogging break that had stretched to several months. After many years of long working hours and few days off, I suddenly had quite a bit of time on my hands while I was moving towards the next phase of my working life. Which could mean only one thing: time for a new series on the blog! I knew exactly what I wanted to focus on. We are constantly being bombarded with findings about nutrition, and while so many of the studies remain controversial, one fact is simply undeniable: it is just a really good idea to pump up our vegetable consumption. Vegetables are almost magical- they are low in fat and calories, and simply bursting with naturally occurring chemicals that do wonders in the human body- fighting chronic disease and promoting healthier lives. The fact is, for most of the people on this planet, vegetables are simply unaffordable and inaccessible. For a well-to-do and well-fed person like me, it would be a shame if I did not take advantage of my privileged life and eat to keep my body as healthy as I can. And as I started to work on increasing my vegetable consumption, it made sense to start "at home", learning all that I could about the cuisines of India and their love for vegetable dishes. As for cooking by alphabet, it is just a silly whimsical way of going about my little journey. A way to amuse myself. a) I keep a large box in the fridge for "odds and ends" of vegetables- a half of an onion, a wedge of cabbage that got left over from a subzi...these come in useful to fill out future meals and virtually eliminate wastage of precious veggies. For instance, one large head of red cabbage recently was served at four meals- as a "pachadi", with other veggies in a noodle stir-fry, in a "thoran" and a raw garnish for quesadillas. b) I find that some vegetables- green peppers, green onions (spring onions), fresh herbs, fresh lemons go a long way in making easy dinners taste really good by adding a fresh note. I always try to keep these on hand. c) Thursday or Friday nights, I plan a fridge-cleaning menu, trying to use up all perishable veggies and get ready for the shopping trip the next day. Some dishes- mixed veg pulao, vegetable noodles, vegetable soup- are just made for such occasions! "I had been to the market this morning and bought some 'Kantoli', i.e. Raan Karli or 'Phagala' as they are called in Konkani. They make wonderful 'Kaapa', you know. We made that this afternoon. I'm sending you some pictures in case you are interested. The thin slices of the 'Kantoli' are shallow fried in rice flour to which chilli powder, dhane and jira are added with salt to taste.They make a lovely crispy dish which goes very well with Rice and Daal." (Dhane is coriander seeds, and jira is cumin seeds...in this case, it is the powdered spices that are used). 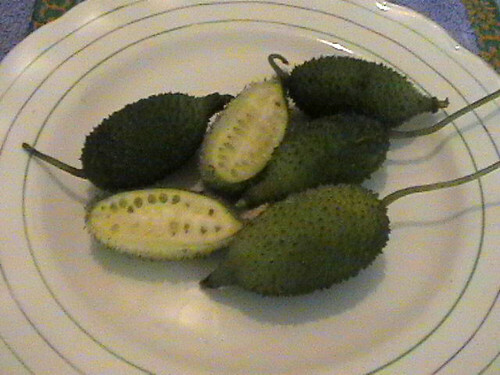 This is what the kantoli looks like- a very unusual vegetable, small in size, with a prickly exterior. Now, coming to my entry: Z came around at just the right time, at the peak of summer, when it is raining zucchinis in the vegetable markets! This is my contribution to the menu at the Zany Zucchini Cafe. I wanted to make something rich and festive for this last round. In my parents' home, a "party dish" that has always been very popular is Kofta Curry, with fried dumplings bobbing about merrily in a rich tomato-onion sauce. I hesitate to make it because the dumplings are made of bottle gourd and chickpea flour, and I don't really have access to bottle gourd. The fact that the dumplings are traditionally deep-fried puts me off even more. Then, a few days ago, I was watching TV when I caught a commercial selling an As-Seen-On-TV kitchen product called the Pancake Puff Pan (nothing but a appey pan or aebelskiver pan or appam chatti or whatever you want to call it). Now, I don't know if you have seen these type of ads. They are very very smart ads: they sell a kitchen product that is billed as the latest and greatest invention ever. They demonstrate hundreds of uses for that kitchen product, and in the short span of 3-4 minutes, they leave you utterly convinced that the product is about to change your life forever. In any case, this ad showed a dozen different uses for the puff pancake pan- making mini ball-omelettes, and mini pizza puffs- that left me gaping with awe. A little light bulb lit up over my head, and I thought-hmm, I should try making my koftas in my appey pan. So, as you will see in the recipe below, I did make the koftas in the appey pan, with only a few drops of oil. Was the experiment successful? Well, the koftas that resulted were not perfectly cooked all the way through, and so could not be eaten just as they were. But, once they were added to the curry and simmered for a few minutes, they were cooked to perfection! This is definitely a method that I'm going to use from now on...I might have to work on it to determine the heat level needed to let the koftas cook all the way through. In fact, the next experiment is going to be- making the pakodas for kadhi-pakoda. This time, I did not add any garam masala or other spices to the curry. I let the flavors of the coconut, poppy seeds and sesame seeds shine, and it tasted quite delicious to me. With all those ingredients, this is a very rich curry! 1. Make the koftas: Mix 1.5 C shredded zucchini, 1/2 C besan (chickpea flour), 2 T minced onion, 1 t coriander-cumin powder, and salt, turmeric and red chilli powder to taste, and make a thick batter (you do not need water, the water from the zucchini is sufficient). Spray a appey pan with oil, then drop little spoonfuls of the batter into each depression. Cook until golden brown on both sides. Set the koftas aside. This yields about 20 small koftas. 2. Make the onion-tomato base: Heat 2 t oil in a saucepan. Fry 2 chopped onions until lightly browned. Add 1 t ginger-garlic paste and fry for a minute. Add 2 C tomato puree, salt, turmeric and red chilli powder to taste and simmer for 5-10 minutes. Puree to a fine paste. 3. Make a seed powder: Toast together 2 T white sesame seeds and 2 T poppy seeds, then cool and grind to a fine powder. 4. Make the curry: Mix the tomato-onion paste, seed powder and 1/2 C coconut milk and bring to a gentle boil. Add some water as required to make a thick curry, then simmer it for 5 minutes. Add the koftas and simmer gently for 5 minutes more. Serve hot. As you can see in the picture above, I served the zucchini kofta curry with fresh layered parathas, dahi kanda (sliced onions and minced cilantro dressed with yogurt) and a wedge of lemon. It made for a very enjoyable dinner! I want to thank Lakshmi for suggesting that I convert this series into an event in the first place. Before she left that comment, I had no inkling that anyone would have the faintest interest in being part of this. Also, a big hug to Swapna for designing a logo for this event...I was so pleasantly surprised when she mailed it to me. The credit for the way things would shape up every week goes to the enthusiastic bloggers who sent in entries, whether they participated in one event, a few, several or *all twenty-three*, like the champions Asha, Bee and Jai and Suma! One last thing: many of you have been asking me, What comes next? Well, it so happens that I am starting a new job tomorrow (perfect timing, eh? ), and life is about to get very hectic yet again. I have had my fill of hosting events for a while, with this weekly series and the behemoth RCI. For a few months, I will focus on the other things in my life- my job and my academic commitments and a little project that I want to do for my local community kitchen. I will keep blogging, of course, and participating in the wonderful events going on in the food blog world as much as I can. Wow, this has become a HUGE post, so I'll sign off now! Aww Nupur, I am REALLY sad to see this series end. But the incredible variety of both the recipes and the ingredients used by you and fellow bloggers has been truly inspiring! Thankyou again for this wonderful series where I eagerly await the next one :). A big hug to you girl for displaying the highest level of committment towards this long stretch of events- not a single of your posts showed any signs of haste or boredom, giving so much attention to detail and showing so much passion. Hats off to you. WIshing you very good luck in all your forthcoming assignments. Wow, Nupur, that was a BRILLIANT series. Congratulations, and thanks for your cheerful hard work and amazing creativity in putting this together. I am totally in awe! I cannot tell you how many lunches and dinners I have made from your recipes - and now suddenly I get looks of appreciative respect from my family! All my friends have been told about your blog and I hear (and I' sure you do too) raves from them. Best wishes for your new job and whatever lies ahead. What a lovely read, Nupur! Congratulations! and best wishes for your new endeavours :). It was really touching to read your Baba's words.....i could prefectly relate to those, because my Dad too has only recently started reading my blog and we end up discussing these recipes and more, quite often. and lovely way to make koftas, i'll do the same from now one (as it also helps avoid munching the koftas!). One can't thank you enough for putting together splendid roundups week after week! So, dear, here's wishing you the best of luck for everything that you do. Thank you so much for this wonderful series. 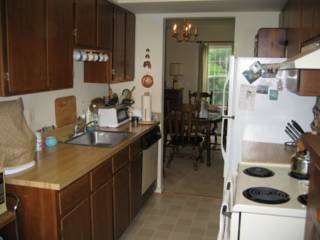 I can't tell you how much I have learnt from your blog since I discovered it mid-2005 - healthful recipes, how to minimize waste in the kitchen, wonderful cookbooks and a lot more. Although I have never participated in the series, I would religiously await your round-up every Sunday and I feel bad that it is ending. Congratulations on your new job and wishing you all the best. P.S. : Koftas in an appey pan - why didn't I think of it - simply brilliant! Zat waz absolutely fabulouzzzzz!! :) Very clever with appam patra for making koftas! I am gonna make that next weekend!! Thats such a healthy way to make kofta curry Nupur.... unfortuantely i dont have an appey pan...Hats off to you for the dedication and enthusiasm that you showed in hosting this series. Learnt a lot from you and enjoyed participating. 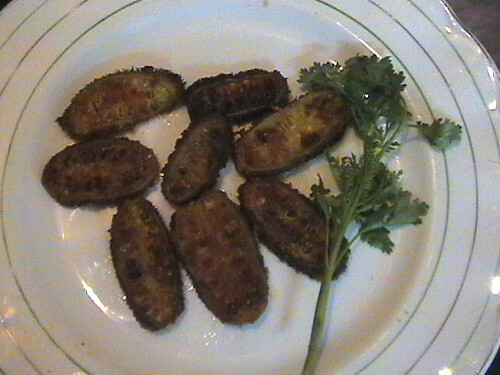 What you call "kantoli" we call "kartoli" and make sabzi out of it- similar to a bittergourd sabzi (the dry version). Had never heard of kantoli kaaps... something new to learn... thanks again for sharing and good luck with your new job. Hats off to you to show such a great deal of enthusiasm and commitment and host this event every week! Nupur, Congratulations on a wonderful series with a whole lot of vegetables!! :) It was very interesting and enriching to say the least. It is a pity that it's over. 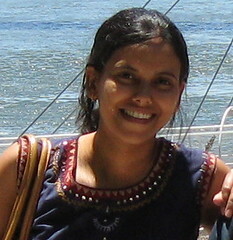 Like Nandita mentioned, you have been a great host, showing so much enthusiasm, week after week. The koftas look great and that was a brilliant idea to make them in an appey pan. Will try that sometime. Thank you for everything! Thank you so much for taking time for round ups and commenting as well.Although I missed A to D,I loved cooking all the dishes and I learnt a lot in the process too. This is a great way to end with ZZZZs,all of them look great.Enjoy your new job and take it easy.Best of luck to you. you are a genius, Nupur! using the appey pan for kofta, what a fantastic idea :) Have thoroughly enjoyed ur series, could not participate for the last few though :( Thnaks for all ur efforts & hard work every week. Good Luck with ur new assignment. I was on my way out, but cud not resist commenting on this fabulous post. Hugs! Thank you Nupur for this excellent blog event. I, like everyone else, have thoroughly enjoyed. Good luck with your new post. Mamatha, aww...what a nice thing to say! I felt a little lump in my throat when I put up this post too :) Let me know if you try the appey pan method for koftas! Who says watching trashy TV does not have its uses ;) that is where I got this idea. Laavanya, the alphabet needs more letter, right? I feel the same way :D Thanks for supporting the event! Asha, thanks for your enthusiastic participation! It was great! Wow, what a great accomplishment. I've enjoyed reading it every week. Congratulations on the new job too! 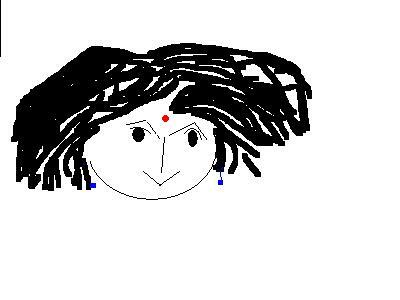 Hi Nupur ~ I've watched this event unfold in complete admiration, from the creativity of the entries to the zeal (yes!) of your weekly round-ups. What great inspiration. And I especially appreciate your ideas for veggie-centric meal-planning, they are really good ones. The one I plan to adopt is the "odd and ends" bin, I even already have the bin in a vegetable drawer in the frig, up until now it's held odds and ends of cheese but most often, it's empty. No more! Thanks for so much inspiration, truly. 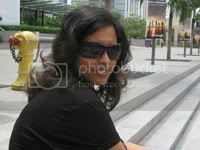 Hi Nupur! I enjoyed reading your post, esp the tips on how to save leftover odds and ends of vegetables - now I've to shop for a large box for my fridge! Also, making koftas in that pan is a good idea - that was a pretty picture! Best of luck on your new job! Nupur Cooking koftas in the Paniyaram pan(there another name for the pan) was a stroke of genius. What a wonderful series it has been. Will surely miss it. There are bloggers like Asha, Bee and Jai and Suma and then there are bloggers like me who have every intention of making it to atleast one of the alphabets and pathetic isn't did not make it to even one. Wish the very best in your new endeavors. Awesome idea Nupur. I am gonna definitely try this. All the best on yr new venture! Congratulations on a series well done Nupur. This has been the most amazing blog event series... You have been a superb hostess and you have ended it with such a great post too.... Good luck with your new job! I am really going to miss this series. I hope forward to your next creation, Nupur. I hope these posts are going to be up for a while as I have fallen behind a little on my notetaking. good luck with your job and all your endeavours, dear nupu. it was wonderful to see your dad's contribution to your blog. The vegetable alphabet has been a wonderful series from start to finish. Thank you for sharing so many of your own recipes and for collecting the ideas and inspiration of bloggers around the world. I'm going to start an odds-and-ends box in my fridge tonight! A great post to conclude the series. And have a great Mon at work. Those low-fat koftas are how I like mine occasionally. Here's another way: I am sure you are aware of the steamed ghia kaap that is part of Marathi cuisine? I saw my MIL make a few times, and that made me think why not make kofta curry using pieces of that! They freeze very well too! Have a good innings at work. Hey Nupur..congrats on your new job and congrats on completing the A to Z series in a grand fashion.I loved that idea about the koftas in the appe patra. and i keep seeing the kantoli in the local market but didn't know what to do.now i have a recipe thanks to your dada. It has been a wonderful series and I would wait for the roundup eagerly! I am going to miss it.take care and all the best for your new job. Nupur this A-Z round up has been so wonderful. I really appreciate your efforts in hosting this weekly event. Did you cover the pan when the koftas were browning? By covering the pan I feel the koftas should cook through till the center ( like we cover thalipeeth ). Ihave not made koftas for ages because they require frying. Yours is a fantastic idea. All the very best as you start your new job. The timing couldn't have been better. Lovely round up and we will eagerly wait for you to think up and host another series whenever you have the time. Post your post on Jhatpat Appey, I bought an Appey Kayli last evening and had appeys for breakfast. And we saw the Phagals in the market but didn't buy them. They're also called Jungli Karela. You will always be a huge inspiration Nupur. Stay the way you are. I shall stay in touch. I bookmarked this post, for I want to have all the round ups in one. I would like to thank you for letting me participate and learn more about not only different vegetables, but also about different regions and Indian quisine as whole. Your event has been the most inspirational to me, becasue it combines my two passions - vegetables and spices. Alanna, I have to say "the veggie venture" is my prime source of veggie inspiration! Thanks for the constant encouragement! Sra, glad you like it :) thanks for the wishes! Indosungod, that's life, right? Always getting in the way of blogging :) ! Being a reader of this series is just as important, and I appreciate that! Suganya, it really was a fun ride for me too! Sig, thank you so much! Bee, thanks! I was so thrilled to see my Dad taking pictures of food :) It seems to be infectious. Lydia, you have been such a wonderful supporter of this series! And my main source for all kinds of information about common and uncommon pantry staples! Archana, you are so right...I am going to try that next time: covering the pan to let the koftas cook through. I love the fact that I can now make kofta curry whenever I like. Like you, I had almost given up on it because of the deep-frying. Raaga, jungli karela? Wow, very descriptive name! I'll have to tell my dad :) Thanks for all the wishes! Sia, I love your discipline in having one internet-free day a week :) Good way to break that addiction that I seem to have. Thanks for the wishes! Saju, I seem to have missed replying to your comment! Thanks for your participation, and always coming up with something novel! Nupur, the A-z event was a very enthusiastic one. the zuchhini koftas on the appey pan looks like a great idea instead of deep fry. so you are going to be busy dear!! all the best on your new job and take care. forgot to mention, got to see your pics in Kalyn's blog. you looks very pretty. I wonder if the koftas will come out as good if baked in a muffin pan? Good luck with your job.BTW you got me interested int he community project,do write about it! Awesome round up on Z.The koftas look great.Great idea of making it in the appey pan.Appriciate all your efforts for this series.All the Best.Durga. I have to compliment you by saying that you are looking gorgious at the blogger meeting. Awesome pictures. Great round up, though I do not participate that often still I make sure to check the round up every sunday. Great job, would like to see more events coming from you ofcourse first preference to career and academics. Though I could never particpate in this A-Z series (thanks to my 4 month old, I hardly spend any time in the kitchen :)), I was all choked up reading your post on Z :) It looks like you had a gala time with the series and in the process created what's probably the largest collection of vegetable recipes, cooked the Indian way! I know where I'll be heading to if I ever need an idea to cook any vegetable differently! Awesome work!! I throughly enjoyed this A to z of veggies and have learnt a lot from your blog. Your cauliflower with olives and caper and spaghetti with soy meatballs sounds intresting to me ...why dont you post about it sometime? It was wonderful being part of a such good series. It was amazing to see how wonderfully and patiently, you tried to present each contributor's recipe beside yours. Love your idea of zucchini kofta curry. I have never tried kofta curries. Right now, I have a bottle gourd and am going to try this. First off.. Congratulations to u Nupur, for making this journey from A-Z a success! It was wonderful participating and learning soooooo much.. and I don't mean just the recipes.. ur dedication to this is inspiring! and CONGRATS again, and All the Best for ur new job!! U r sure to shine in it!!! I must ry the zuchhini koftas, I have tasted zuchhini just once and unfortunately ,I did not like it... bland is what I termed it and shoved it at the back of my mind.. but ur awesome recipe has made me reconsider my opinion! using the appey patra is a wonderful idea. Will try when time permits and let u know! Thank you for your wonderful guidance, and also for the previous series, which was AWESOME!!! And thanks to all who participated in this event. You have done more than your share contributing to the blog world - enjoy a break for a while. You are one of my very favorite bloggers though, so please do dop in and keep us posted from time to time with your doings and your recipes. PS - I don't like zucchini either (too watery), but will try this tonight with fuzzy melon, which I happen to have in the fridge. Thanks for the two really great A-Z series. Good luck with you community kitchen project. Do write about it sometime. Dear Nupur, Like everyone else, I am sorry to see this series end, but I know we'll still being seeing great things from your kitchen. This was a huge undertaking and you did a fantastic job from start to finish - congratulations and thank you!!! 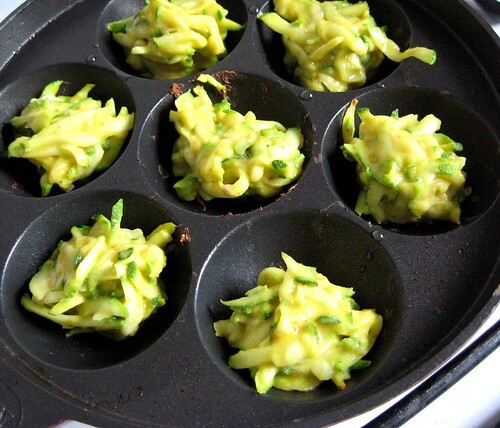 Supriya, muffin pans is an interesting idea. 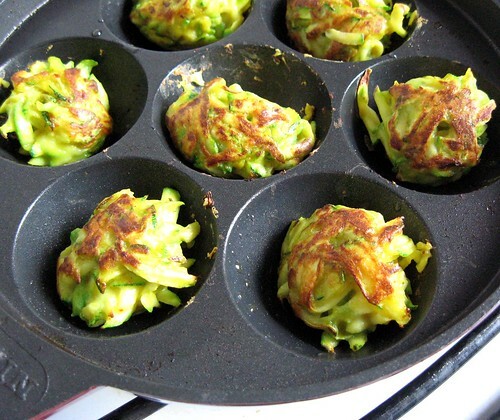 Maybe mini muffin pans? Because the regular ones are quite huge. Roopa, I got choked up writing it :) thanks for your support! Roshni, I'll definitely post those recipes..stay tuned! Suma, it is amazing how you came up with delicious recipes each week! Cathy, thanks so much! :) Your Y entry was such a treat! hope all is well, nupur. remembered this from a while ago. making your koftas this afternoon - albeit with acorn squash. take care and have a happy thanksgiving. I came across your blog several years ago and though I did not keep up your posts on a regular basis I do visit it every so often when I am looking for a vegetarian recipe or something Maharashtrian. And I have never been disappointed by your recipes. I love the way you describe it all. My last experiment from your blog was baked zucchini kofta curry. I skipped the coconut milk but it still turned out delicious. I am so excited to find a healthy, no-fry kofta recipe. Using the appey pan is a brilliant idea. My MIL was also inspired and made onion bhajiyas in it. They turned out a bit stiff but tasted great. 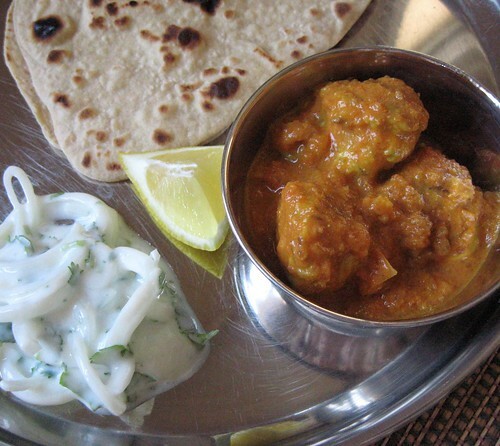 And so I am back here to revisit the recipe as I am going to make your kofta curry with bottle gourd. Thanks so much for your blog. It is always a pleasure to read your posts. Goodluck and best wishes in all that you do. Thank you so much for this nice note, Namrata! I am so glad the recipe worked for you. Best wishes and happy cooking!